England & Russia were in a battle of words with Russia, accusing England of helping to rearm west Germany after World War II and England responded by saying that Russia was trying to spread communism across Europe. Both were true—England did help West Germany arms and Russia was and still is spreading communism across Europe. Nothing has changed has it? The earliest roots of Sand Hill Church reach back to the days of Elkins Gospel Mission in the late 1940’s. It was this very sanctuary that Sand Hill Church was born on February 18, 1951 when Reverend H. M. Hocutt, who was the shepherd of Buncombe Baptists as a missionary to the churches, called an organizing church council together made up of 40 people who were members of other Baptist churches, to constitute the establishment of a new Baptist church. A motion was made by N. T. Stansberry and seconded by W. H. Passmore that the name of the new church be called Sand Hill Missionary Baptist Church. The motion was agreed to and at that same meeting, Reverend N. L. Stephens was called as the church’s first pastor. There were 26 charter members: 18 came by letter from other Baptist churches, 2 came on a promise of a letter, 4 came as a candidate for baptism, and 2 came on a statement of faith that thy had been saved. The church also elected its first deacon, who was Mr. W. H. Passmore; a motion was made by W. H. Passmore and seconded by Mr. R. L. Crisp that Sand Hill give its first missions offering. The amount given was $13.00. With a church given birth, a pastor and a deacon called, and an offering received, the purpose of the meeting was finished and a motion was then made that the meeting adjourn. The church elected other offices as the need arose. In October, 1951, Sand Hill ordained 3 deacons: O. D. McFalls, Joe Cochran, and W. H. Passmore. In January 1952, Mr. H. C. Green, who was already ordained, was installed as a deacon. 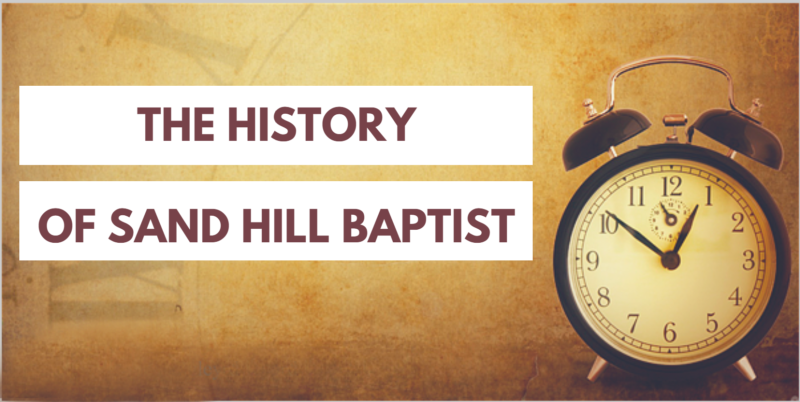 In March of 1952, Sand Hill was told by the Trustees of Elkins Gospel Mission to vacate the building by March of 1953. Sand Hill purchased 2 lots on Bear Creek Road to start a new building. On May 4, 1952 the groundbreaking service was held and construction began. The basement was completed and was used as a worship place until July, 1954, when that property was sold and the church purchased the Elkins Gospel Mission property where we originally began on Sand Hill Road (the church remained there from 1954 until July of 2015). In June, 1956, the church bought 3 vacant lots adjoining the church property. Over the years, much remodeling has occurred and new pews were purchased in March of 1955. The ladies mission group raised the money to buy carpet for the sanctuary in August, 1964 and in November, 1964 they paid for the stained glass windows. In 1969, the fellowship building was erected. In May, 1972 the church sponsored its first missionary couple, Bill and Carolyn Baity at $50.00 per month. In October, 2000, the church voted to support Bill Hensley, missionary to Macedonia. In April, 1976 the loan for the youth building/fellowship hall was paid off when Pastor Melvin Brooks (1963-1978) was pastor. During Pastor James Stroup’s time, the church ceilings were dropped and new lights installed. During Pastor Warren Williams (1984-1987) time, 55 people were saved. During Pastor Charles Sprouse’s (1999-May, 2006) time the McFalls house was removed and the parking lot expanded. Upon the resignation of Pastor Carter, the church called Reverend Mike King for a very short time (2-3 months). Pastor Ricky McCarson was called in October of 2006, and accepted the call in November of 2006 until the present. With the arrival of Pastor Rick, there has been a new burst of excitement and energy in the church, and the congregation began to grow immediately. A Christmas 2006 program was witnessed by about 125 people. General things have become accomplished since 2006. Among them are, in no particular order, updated sanctuary with new pulpit and choir platform, Pastor Rick built a new pulpit from the wood of the choir pews, moved the nursery downstairs and replaced it with a new restroom, remodeled the Pastor’s office, remodeled the fellowship hall to increase seating capacity. We baptized 7 people in Hominy Creek and paid off the loan we had on the property. The largest project the church has undertaken is selling the property on Sand Hill Road and buying 7 acres on Moody Avenue in the Enka Area. We are in the process of building a new campus which is now under construction under Pastor Rick’s leadership, Sand Hill Church has continued to support Bill Hensley who has returned state side to work with Macedonia people in Detroit, Missouri, and added support to 9 more missionaries who are working in Philippines, Alaska, Iraq, Brazil, Africa, Egypt, and Peru. We have sent out 2 preachers; (1) Brother Derrick McCarson, who is now pastor of Liberty Baptist Church in Candler, North Carolina and (2) Brother Justin McCarson, Pastor Rick & Janice’s son, who graduated from Georgia Baptist & Theological Seminary of Senoia, Georgia in May of 2015. Justin and his wife Kayla are now seeking the Lord’s direction for their ministry. Brother Will Hux and his wife Kristie were saved and baptized at Sand Hill and are now helping the church with music and sound as they seek God’s will for their future. We are now in the process of updating our church constitution and by-laws to address present day issues. We currently have 2 men chosen by the church to serve as active deacons; Brother John Coley and Clifford Tipton. During Pastor Rick’s ministry here we have had to say goodbye to 5 members whom the Lord has called unto Himself: Agnes Redden, Wanda Reynolds, Sandra Cutshall, Mae Shipley, and Ruth Masters. Looking at the journal the clerks used to record membership activity, there was an entry for Wanda Reynolds who joined the church on September 17, 1961 with a letter from Edgewood Baptist Church, on down the page was an entry for Mae Shipley who joined the church November 5, 1961 with a letter from State Street Baptist Church and 2 or 3 pages over was an entry for Joyce and, son, Ray Lynch who joined the church February 5, 1968 with a letter from Liberty Baptist Church. September 1963-Deacons passed a motion to replace broken windows in the church. October 1963-It was moved and seconded that the church buy a new lawn mower. Mr. Passmore was told to sell the old one for $10.00. November 1963-Deacons approved a motion to buy new shrubbery for the front of the church. The men’s mission group would pay for 6 plants. July 1978-Deacons decided that the church would pay the new pastor, Pastor E. V. Plemmons $100.00 a week. September 1978-Approved buying 4 new speakers so the sound would reach the back without having to turn the volume up so loud. Cost: $75.00. November 1978-Agreed to pay Pastor Plemmons salary for 5 weeks while he was recovering from surgery. March 1979-Approved new doors for the front of church. August 1981-Discussed a request by 2 elderly women that the church buy a van. October 1981-Approved a bid by Banitz Company to install drop ceiling for $2,805.00 and Holcombe Electric Company to install new lights for $450.00. December 1981-Approved a motion to install another circuit in the sanctuary so the fuses won’t burn out so much. June 1986-Joyce Lynch was recommended to be church clerk after the resignation of Pauline Brinbley. March 1987-Approved motion to install a sump pump in basement to control water when it rained. May 1988-Approved motion that any church leader or teacher absent 4 Sundays in a row will be replaced. December 1989-Deacons reported that the church had 14 widows who were shut-in and not able to attend church. February 1990-Decided to have ladies restroom remodeled. April 1990-Decided not to have Vacation Bible School (VBS) that year because there were no young people and no teachers. After 64 years of ministry at 232 Sand Hill Road, the church held their last meeting at that location on Sunday, July 12, 2015. The property was sold and the investors who bought the property demolished the old church building to make room for a row of houses. The building of a new church began at 190 Moody Avenue. A new chapter began for Sand Hill. As long as time permits before the Lord’s second coming, we will continue to write history.